"It was thrilling to have Jeannette and Jorge on our campus for two days. The insightful presentations, intertwined by the wonderful segments of tango dancing, were very meaningful to all who attended. Correlating communication skills through the "art of dance" is a non-threatening way to encourage everyone to examine their communication faux pas and to work to improve their everyday communication skills. Dr. Tango is a pleasure to work with and everyone came away "buzzing" about the program and the beautiful dancing!" "Dr. 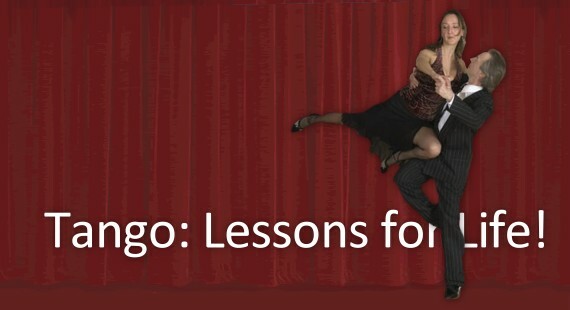 Tango's presentation (which is greatly enhanced with examples of tango dancing) is filled with basic life lessons, which the audience can use on a daily basis. The correlations between the tango and our abilities to both communicate more effectively and to become better leaders were presented in a manner that each person could see and practically feel: the dance can be directly correlated to our personal and professional lives. Jeannette's passion for what she is doing is infectious and the attendees at the Simon Foundation for Continence's Innovating for Continence conference came away "buzzing" after the presentation on the valuable lessons they had just learned in a very new and unique way. Thank you, Dr. Tango!" "...It reminded me of all the best artists I have seen, as they've performed together. Alone in a way, a private victory only you two understand. Then you brought the meaning to light after each dance and tied all of it together as a humble teacher... I looked into the audience, both while you were dancing and while you were speaking. And everyone was so engaged for such a very diverse crowd." "For many years, Jeannette has served as educational resource as well as valuable doctor to the YPO/WPO and CEO membership... I would recommend her to any of the 'O' groups as a top rated resource." Our members were very impressed with your presentation. They felt you gave them new information that would help them be better Leaders. I enjoyed your presentation because it was unique and allowed us to think out of the box in terms of dealing with the daily stress of trying to be a good leader. Thanks so much!! "Interesting metaphor for life and relationships. Appealing visual display of concepts"
"... I found the speaker inspirational and really enjoyed the program"
"Great event-took lessons of dance and applied them to all relationships-fun event"
"An excellent business and personal life lesson reminder-a great reminder to have purpose and humility in your relations"
I have seen many speakers to include Gen. Colin Powell. She was one of the best I have seen. I just love and admire her passion for what she does and for what she enjoys. It is truly inspiring. She nearly brought me to tears. People like Dr. Tango are rare and sometimes never seen by people. No one has ever held my complete interest for so long. I am really moved by the love and passion for life that Dr. Tango has. Refreshing, thought provoking and so intelligent with a common sense nature. There is always room for improvement - I just don't see how in this instance. Dr. Tango's presentation was very well put together and extremely relevant. I don't think I could improve anything...probably the best presentation I have ever seen. There is nothing that I could even hope to improve on. She was one of the best speakers I have had the privilege to see. She made it so easy to relate the tango to all aspects of life, not just with business or leadership. The interlude of tango dancing was a nice respite from the methods of typical speakers and will help her presentation to be remembered for a much longer period of time. She was the most engaging speaker I have seen. Vivacious, engaging, enthusiastic and empathetic. Also, a good listener. Refreshing; engaging; a pleasure to watch. Dr. Tango is vivacious, interesting and extremely intelligent. I love that Dr. Tango can relate to the corporate world with ideas such as "leading with your heart." It's very refreshing. Vivacious; personable; alluring; animated; lively. Tangolicious! Great presentation. Very clear and to the point; really made me think. She was so outgoing and uplifting. Her personality made it easy to relate to her but then she also had an aura of power that made you really want to listen to her. I found it extremely interesting how Tango is a representation of the dance of life. Not only was it different and refreshing, but it was her passion for what she does and for who she is that validates the content of her presentation. No only would I recommend it but I'm making it mandatory that my Staffers attend any upcoming presentations. She did a fabulous job bringing management skills and the tango together. I can only hope to meet another person like Dr. Tango. I really connected. Dr. Tango's presentation was not only a form of educating, it was also rewarding and FUN. Very well done! The dance fully demonstrated the "leader/follower" relationship. I thought her presentation was wonderful. It was not at all what I expected and this was my first CCMSA meeting and I was so very pleased. She seems to be full of life. I also like to dance and I know that when you're engaged in something that you are passionate about, it shows to everyone you come in contact with. I was very touched that she said good-bye to me and mentioned my grandson, who is ill.
She is engaging and comfortable. Covers the objection of possible non-interest in a tango dance by clearly expressing how she became involved. Dr. Tango also clearly overcame what some may think as uncomfortable, the submissive role in tango and just how that can be helpful when you work in a business high-powered position. I really like this presentation, as you can see. Dr. Tango was very engaging and seemed to relate well with those in the audience. Dr. Potts is a wonderful person and she definitely convinced me to take a good hard look at myself. Her talk was very inspirational and she was definitely well received by all of our members. Personally, I learned the importance of letting go and acceptance. I just hope I can actually achieve it. Jeannette--I was enthralled with your presentation at the recent Cleveland Coach Federation meeting. I look forward to attending one of your future workshops/presentations. Thank you again for a wonderful morning! Darlene--Wow, what a wonderful morning! You were soooo right to encourage me to make it back for her presentation. I made that extra effort to get back on Thursday night so that I could be at the CCF meeting on Friday. IT WAS GREAT! I just went to her website and read every page. Even better. I would love to hear her again, so will watch for oppty. In yoga we learn of auras, a glow that surrounds a person that is their true spirit. The more connected to the world the bigger the glow. With Dr. Tango I almost need sun glasses. What a present and connected person. Wonderful presenter with very unique ideas. These ideas need to be implemented in the real world everyday. Please read the explanation: Iceberg Why? Because I saw something on the surface and drew some conclusions, then later discovered that 90% of what she's about is below the surface. WOW! And that is a very positive, powerful WOW! Thanks! Gestalt through the art and joy of dance. She teaches a very valuable concept of leadership and communication (truly connecting with someone) through Tango, something one will always remember. Entertains the audience and demonstrate how dance can be used as a tool to teach. Using experiences as an MD and a tango enthusiast, she blends them to provide insights into leadership and emotional intelligence. Creates an opportunity to explore the language of non-verbal in a world that only hears the verbal! I recently attended the Crain's program on Wellness Programs in the Workplace. I was so mesmerized by your philosophy on life I just have to ask you if you would have an interest in giving an overview of your programs to a coaching group here in Cleveland. I just love Dr. Potts. I don't know...I was just drawn to her from across the room! I can't believe I have to wait an entire month plus for this event. I am so thrilled, it feels like Christmas is coming!! I attended your panel discussion at the Crains breakfast. I would love to enroll in a class or learn more about your classes. I am interested in her approach to life. Would love to learn how she can work with me and my people. I would love to find out how to put something together for my client annual meeting.